Despite the “weighty” name, heavy metals can actually be as light as the air you breathe. And, similar to air, toxins from those metals can be invisible. Toxic metals, which include “heavy metals,” are characterized as a select group of metals and compounds that negatively impacts people’s health. Health risks increase substantially for workers whom endure prolonged exposure to large amounts. With high prevalence on worksites, 35 toxic heavy metals are regulated by OSHA. Few, if any, are more extensively regulated than arsenic, beryllium, cadmium, hexavalent chromium, lead, and mercury. Listed below are a few reasons why. A natural element commonly found in water, rocks and soil, metallic arsenic is used in many industries as an alloy agent for solders and heavy metals. It’s also used to preserve pressure-treated lumber, as an agent in pesticides, and for pigmenting. As per the Centers for Disease Control and Prevention (CDC), workers in industries such as carpentry, copper or lead smelting, electronics manufacturing, and pesticide application are at the highest risk of exposure. Beryllium is a very light, though extremely strong, highly toxic metal used in aerospace, electronics, energy, telecommunication, and medical/defense industries. Workers with the highest likelihood of exposure to beryllium are those who work in beryllium manufacturing, alloy production, and recycling — as well as mining and extraction. Approximately 62,000 workers who inhale beryllium-contaminated air are at an increased risk for beryllium sensitization, lung cancer, and chronic beryllium disease (CBD). In March 2017, OSHA released its final rule on the new beryllium standard. With the new regulations, the administration expects to save about 94 lives from beryllium-related diseases, and prevent approximately 46 new cases of CBD annually. The projected net benefits are projected to be about $560.9 million each year. See the key provisions and updated compliance schedule here. Cadmium is a soft, malleable bluish-white metal found in zinc ores. It is most likely to be present on worksites where metal is smelted or refined; and in the manufacturing of batteries, plastics, coatings, and solar panels. More than 300,000 workers are at risk of exposure in industries such as manufacturing and construction. Inhalation or ingestion of this highly toxic metal can cause cancer and damage lungs, kidneys, and bones. Cadmium poisoning may also present itself in flu-like symptoms. See the cadmium compliance checklist here. A toxic form of the element chromium, hexavalent chromium is a man-made compound widely used in various industries. It’s found in chromate pigments (i.e. dyes and paints); ferrochromium ore; and even in portland cement. Workers may be exposed during “hot work,” such as welding metals or steel. Hexavalent chromium is a known carcinogen. In addition to cancer, this substance can also cause asthma, eye damage, and allergic contact dermatitis. OSHA has specific hexavalent chromium regulations for general industry, shipyards, and construction. Lead, a corrosion-resistant, malleable blue-gray metal, occurs naturally in the Earth’s crust. Lead poisoning is one of the most common heavy metal exposure threats to workers, and has been for thousands of years. As one of the first metals ever used by humans, lead exposure lead to the first ever recorded occupational disease – a severe case of lead colic suffered by a metal extractor in the 4th century. Exposure can also occur during the production and/or use of rechargeable batteries, lead bullets, and radiators. Overexposure via ingestion and inhalation may lead to severe health issues such as lowered blood levels, which results in decreased cognitive function. Mercury, a naturally occurring heavy metal, is considered as a transitional metal as it exists in many forms. At room temperature, the element, often referred to as “quicksilver,” is liquid, but it can quickly turn into a solid or gas. Workers are most likely to be overexposed to mercury in mining and refinement processes. Mercury exposure may also occur when fluorescent bulbs break and mercury vapor enters the air. High levels of exposure can lead to permanent damage of the nervous system and kidneys. Some mercury poisoning symptoms include: mild tremors, mood swings, impaired memory, and skin irritation. There is no current evidence that mercury is a carcinogen, although mercury chloride and methyl mercury may be linked to cancer. See how to keep workers protected from mercury exposure here. Even though these heavy metals differ, all can be tested in a single screening by the use of heavy-metal panels. These panels are performed in a group of tests tailored to an employee’s occupation, symptoms, and suspected exposure. 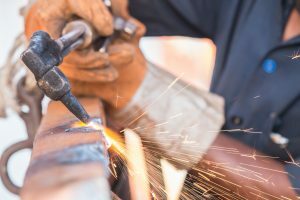 A broad panel may be ordered by a qualified medical professional if he/she suspects that an employee has been acutely or chronically exposed to more than one heavy metal. Similarly, if the medical professional believes that an employee has been exposed to one specific metal, such as lead, he/she may choose to order one test. While heavy metal is typically regulated on most worksites (i.e. required PPE), health screening within a comprehensive medical surveillance program is necessary. According to OSHA, the purpose of medical surveillance “is to supplement the main thrust of the standard which is aimed at minimizing airborne concentrations of lead [and other heavy metals] and sources of ingestion. OSHA penalties and fines for noncompliance with heavy metal regulations vary case by case. However, when employers sacrifice safety and precaution for efficiency and cost savings, they can expect to pay in more ways than one. In 2016, two-thirds of a Wisconsin-based shipyard’s workforce — 177 out of 233 — tested positive for lead poisoning. OSHA sampling results found that 14 workers had lead levels of up to 20 times the permissible exposure limit. The administration cited 14 willful health violations for each instance where workers were overexposed; as well as five violations for failing to screen employees for exposure, failure to create a compliance program for lead, and failure to provide training on lead and asbestos hazards. “This employer was unwilling to pay the necessary costs to protect employees from lead exposure,” OSHA’s assistant secretary of labor Dr. David Michaels said. The company faced nearly $1.4 million in fines and paid a settlement of $700,000. It’s time to stop viewing medical surveillance as an administrative burden, especially when there are companies that can do it for you. Scheduling, tracking medical records, and doing it all correctly is easy — especially with mobile units that can come directly to your worksite.